When I was choosing paint for Old Salt Farm, I knew I wanted the entire house two be white, and that’s what I did–with two exceptions. My oldest son’s room is gray (at his request), and I have a chalkboard wall in the kitchen. It’s the wall that my double pantry is on, so it’s not really a full wall, but it’s really the perfect amount. I’ve had a lot of questions and comments about it, and I thought I’d answer them here and tell you why I love my chalkboard wall! *I’ve included affiliate links below for your convenience. If you click on one of these links and make a purchase, I receive a small commission that helps support this blog, and you don’t pay any extra. It added contrast to my otherwise white kitchen, and surrounding area. 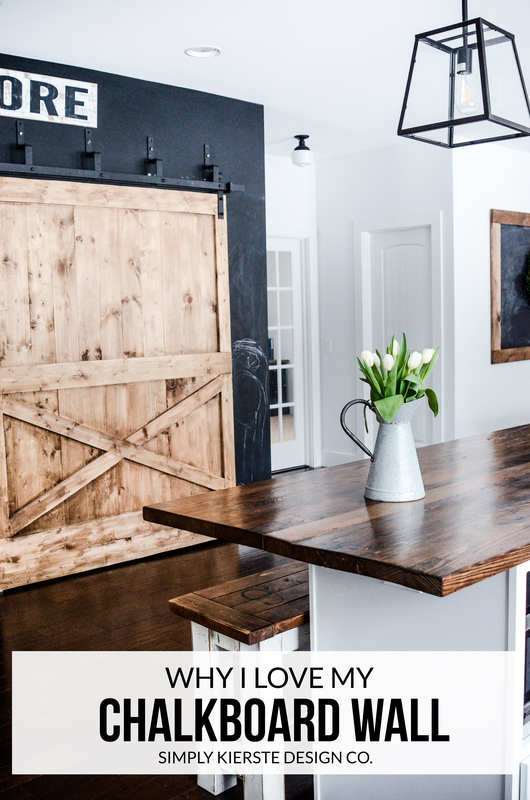 Chalkboards are a big part of farmhouse style, and I’ve always loved the idea of having a huge chalkboard in the kitchen. I wanted a place to write my grocery list, menu, as well as an area for my kids to draw! The painter did the actually painting of the chalkboard wall when our house was built, since he was already doing the whole house, and this just counted as one of my colors. We supplied the paint (Rustoleum chalkboard paint), and he used a foam roller for the walls (two coats), and a small paintbrush for the edges. The walls had been primed before painting. Once the chalkboard paint was dry (let dry for 3 days), we came out to prime the wall before anything touched it, and before using it. This is SUPER IMPORTANT. Chalkboards are porous, so if you don’t prime a chalkboard (any chalkboard–whether you frame it and hang it or paint on the wall), anything you write on there will most likely be permanent. Even if you try to erase it, there will be “ghost marks” left. It’s super easy to do–just lay a piece of chalk on its side and rub it liberally over your entire chalkboard. I like to go up and down, then side to side, just to be safe. Then rub it in with a dry rag and erase it. That’s it! I’ve had quite a few questions about the cleaning and maintenance of the wall, so I thought this would be a good place to address them! Does the chalk make a huge mess? No, it actually doesn’t! When my kids draw on the wall, there is some chalk dust that mostly goes on to the baseboards, and a little on the floor. When they’re finished, I take a wet paper towel and wipe it up—it literally takes 30 seconds or less. I like everything really clean, and it’s been super fast and easy to keep clean. No complaints in this area at all, and I have six kids drawing on it quite often. Is the wall washable? Yes! I leave up my kids’ drawings for awhile, because I like to look at them, but when they’re ready to draw something new, or I need to change my menu, I just use a wet cloth to wipe off the chalk and let it dry before writing again. So easy. You can use soap and water (Rustoleum brand–in their directions) if you need more of a clean. Are you happy with the dark wall? I absolutely love the contrast of the black/dark against the white of the other walls. I think it adds so much to my kitchen, and I would certainly make the same choice again. Do you think chalkboard is going to go out of style? I happened to read a post that was written a few years ago, addressing this very topic, and it insinuated that chalkboard was most definitely on its way out. Fast forward 3+ years later, and it’s still going strong! 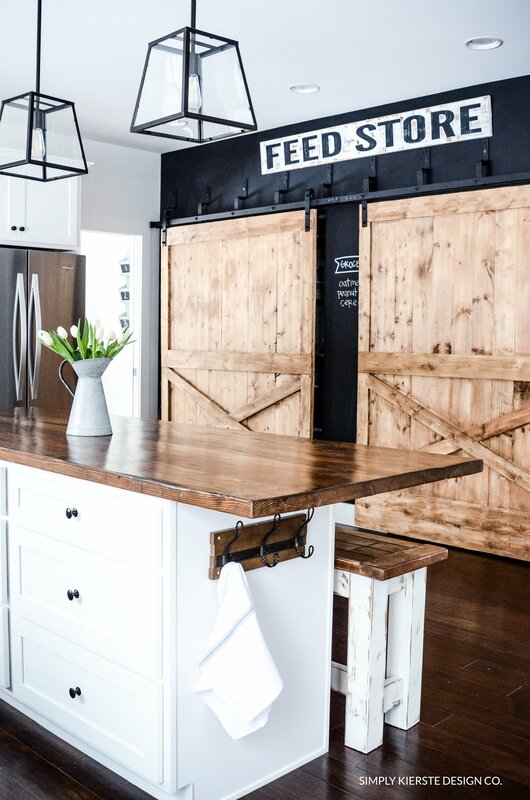 It’s impossible to predict the whims of trend, but I do know this: Chalkboard is the epitome of farmhouse style, which is what I love. 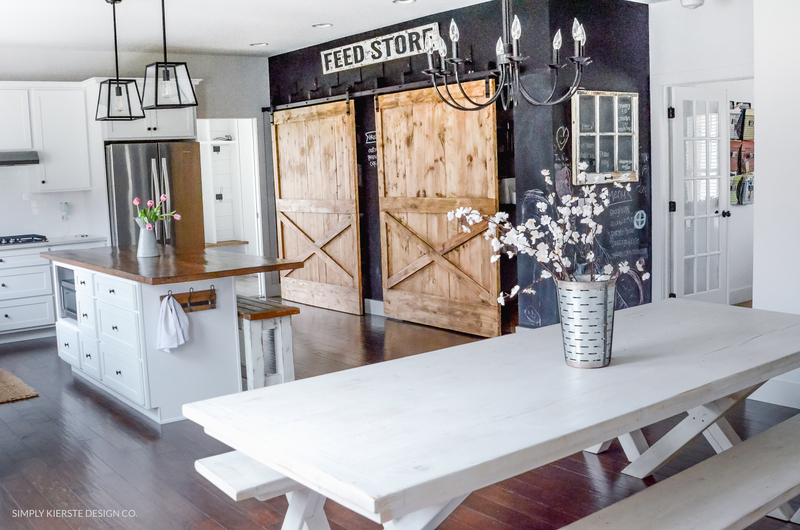 I see it ALL the time in pretty much every home decorated in a farmhouse style. I consider it more of a classic style, but for me, I love it whether it’s “in” or not. 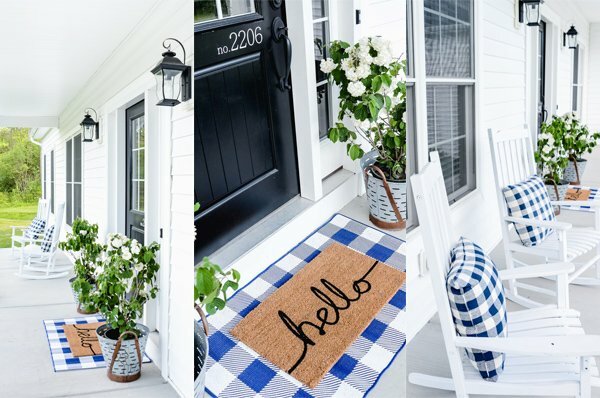 I tend to not follow trends–I do what I love, what fits in my home, and what I want. So, while I love chalkboard, it will be in my home. And it’s paint–super easy to change if I decide to! we have a pantry with chalkboard doors, and i love it!! 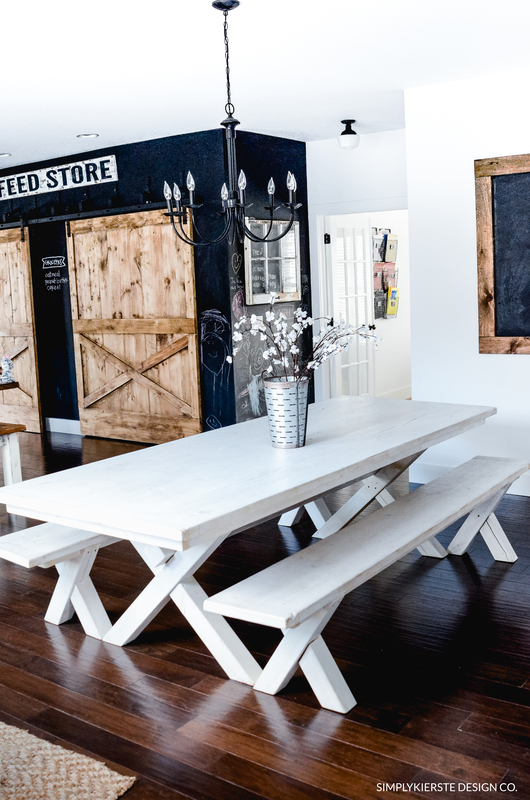 it’s the perfect place to have a chalkboard walls. it gives the kids something to do when i am making dinner too!